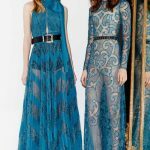 Zuhair Murad said his fall collection represented the culmination of his efforts to expand the daywear component of his ready-to-wear line. “It was something customers were asking for, but it wasn’t just fueled by demand. 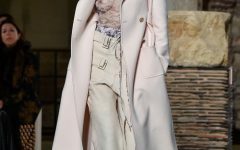 It was my personal desire to work on this line of ready-to-wear, but it took a little while to find the factories and the team that works with me to make a truly complete collection,” he said at a presentation held at the Plaza Athénée hotel. If by daywear you mean a leather wrap miniskirt or a black vinyl trenchcoat with an expansive white fox fur collar, then he was on the right track. 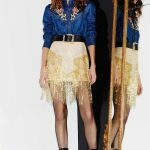 But it was hard to expect much in the way of practicality from a collection inspired by Nineties supermodels and Las Vegas by night. A fringed leather vest, biker pants and figure-sculpting knit dresses complemented Murad’s customary array of red carpet attire. 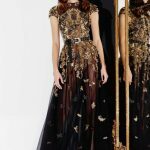 Baroque touches abounded, from the gemstone-shaped sequins on a flimsy black lace evening gown to the colorful 3-D butterflies embroidered on a belted black sequined jacket. 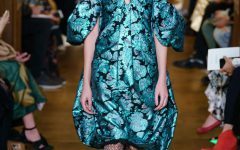 Among the more low-key outfits on offer were pajamas, which came in options ranging from plain black velvet to a blue-green version covered in sequined zigzag stripes with one leg slashed to the thigh. In Murad’s world, even downtime is an excuse for dressing up.